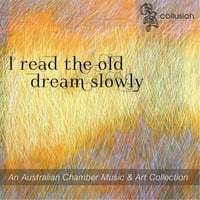 A fine example of new Australian instrumental sounds for strings, clarinet, saxophone and piano, that are easy listening and thought evoking. Music by Australian composers Green, Hawkins, Davidson, Ball, Brophy, Sabin and Twist. In Collusion's vast and impressive repertoire, music from Messiaen to Hindemith; Takemitsu to Australia’s Andrew Schultz, Nigel Sabin, and Nigel Westlake engage large audiences. 2013 sees Collusion invited to perform at the World Clarinet Fest' in Assisi Italy, The Queensland Music Festival, The Australia Saxophone and Clarinet Convention Sydney, and will take up a position as an Ensemble in Residence at Griffith University's Queensland Conservatorium of Music in Collusion's home city Brisbane, Australia. The ensemble has also riveted audiences at the Judith Wright Centre for Contemporary Arts, The Brisbane Powerhouse, Chapel on Chapel Melbourne, Fireworks Art Gallery, The Queensland Art Gallery and at the University of Queensland and Southern Queensland, and the North Queensland Centre for Music. Venue themed performances, collaborations with performance and visual artists at nightclubs, showrooms, professional ballet studios, school classrooms, churches, online, on a river bank, as well as at Concert Halls, have visually and aurally inspired audiences (including up to 20,000 school children per year from 2008) to digest many different styles of art music composition. “The instrumental playing and recorded sound are excellent”— John Barns, 3MBS FM Libretto “The ensemble performance throughout is impeccable as is the sound quality”— Laura Mathison, 4MBS Program Guide. Collusion has performed at festivals such as Soul Food, Restrung, Crosssbows, Bangalow, Tyalgum, Evocations, International Messiaen Conference, and has toured for Musica Viva Countrywide and Education programs. is the director and a founding member of Collusion Music Australia. A freelance musician, his speciality and training is chamber music, however he is also a freelance orchestral musician. He has performed for the Camerata of St John’s Chamber Orchestra as principal 2nd violin and guest leader, the Queensland Symphony Orchestra, the Queensland Ballet, X, Brisbane, Adelaide International Cabaret, and Queensland Festivals amongst others. He has broadcast solo for ABC Classic FM. He has collaborated with contemporary artists like Jazz Trio Elixir, Circa Australia, Human Nature, and even played in professional music theatre productions such as South Pacific for Opera Australia. He studied with Carmel Kaine and Mary Nemet, and has performed in masterclasses for Lord Yehudi Menuhin, Maxim Vengerov, Oleh Krysa and the Takacs String Quartet. Benjamin’s continual attention to professional development as both a performer and pedagog has been supported in the past by Arts Queensland attending masterclasses of Rodney Friend. was accepted into the Queensland Conservatorium at age 13 and graduated at 18 with first class honours and a performance of Shostakovich’s Piano Concerto No.1 with the Queensland Conservatorium Orchestra, winning all major performance awards. Following this, Brieley studied at the Australian National Academy of Music, the Queensland Conservatorium with Natasha Vlassenko, and at the Royal College of Music in London where she graduated with Distinction. Brieley has performed as soloist with the Melbourne, Adelaide, and Queensland Symphony Orchestras, and received 2nd prize in the Kerikeri International Piano Competition 2010, and was keyboard winner of the Symphony Australia Young Performer’s Awards in 2006. Brieley has been recipient of prestigious awards from the Tait Memorial Trust, Australian Music Foundation, and the David Paul Landa Scholarship. Currently pianist with Collusion, she is also Artistic Director of the Commercial Road Chamber Music Series, Brisbane and a doctoral student at Griffith University. is a founding member of Collusion. As a freelance musician, she has performed in countless concerts and recording sessions around Australia with acclaimed classical, jazz and popular music ensembles and artists. These include: the Paris Opera Ballet, Opera Queensland, Opera Australia, Australian Ballet, Queensland Symphony Orchestra, Camerata of St John’s, Olivia Newton-John, Pete Murray, Harry Connick Jnr, Kanye West, Missy Higgins, Xavier Rudd, Kate Miller-Heidke, Pavarotti, Nigel Kennedy, Jon English, Il Divo, Jerry Lewis, Sarah Blasko, Hugh Jackman, Amici Forever, Kate Ceberano, Marcia Hines, Rolf Harris, Aled Jones, Tommy Lee – to name a few. Danielle is an academic, writer, poet and curator. She curates Restrung New Chamber Festival, which was the topic of her PhD exploring contemporary string practice and festival programming. Danielle is also the Festival Manager for Queensland Conservatorium’s Crossbows small ensembles festival. Woodwind specialist Diana Tolmie has had a wonderful time for the past 25 years with her career performing in a multitude of musical genres instigated by a Churchill Fellowship and a Queen Elizabeth Trust Award. Consistent session work has included the Queensland Symphony, Tasmanian Symphony, Malaysian Philharmonic and Orchestra Victoria. With over 30 professional musicals under her belt allowing her national and international travel, she is unafraid to cross genres being as comfortable in Clint Allen's Frank Zappa Big Band as she is with the Doch Gypsy Orchestra and is employed for many contemporary and mainstream live, television and recording events. As lecturer of the saxophone, clarinet and bass clarinet at the Queensland Conservatorium Griffith University she also convenes the professional industry preparation strand My Life As A Musician and is founder and conductor of the Queensland Conservatorium Saxophone Orchestra which tours internationally. Currently an Australian Music Examinations Board examiner, Diana has also acted as an AMEB consultant and editor with 3 publications in her bibliography in addition to editing the Australian Clarinet and Saxophone Magazine.